With the Spring Xbox update just around the corner, it only makes sense that Microsoft's other main E&D device should receive the update treatment as well—after all, we haven't really had a significant update since the launch of the gen 2 devices. With many rightly feeling that the upgrade to Zune v2 had taken away several desirable features, it appears we might be getting a few of those back. 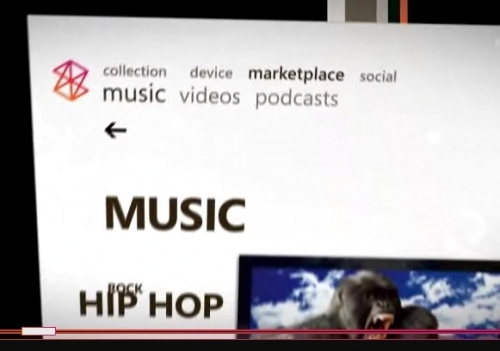 Zunerama member Ricardo Dawkins spotted a video on Zune.net that appears to hint at a few of the upcoming features, including a new genres link in Browse view of the Collection, a videos (!) link in the Marketplace (but strangely no downloads link), and on the artist page in the Marketplace, a new link for "listeners", likely something relating to further Social integration. Notice the "videos" link in the marketplace (and removal of downloads link). Details are of course sketchy (and the video has since been pulled), but we'll keep you updated as the update approaches.